Redoing an entire album is a surprising and bold move, but on This Sweet Old World the gambit pays off. It's anything but a retread. The 60s have been good for Lucinda Williams. Not just the decade, whose music keeps giving, but her age. Since entering her seventh decade four years ago, Williams has made some of the richest music of her career, the double albums Down Where the Spirit Meets the Bone (2014) and The Ghosts of Highway 20 (2016). Maturity, a stable relationship (she's been married since 2009 to her producer/manager Tom Overby), and hard-won self-confidence as a recording artist and performer all inform her recent work. These days she also seems to be enjoying herself more on stage than at any time since I first saw her in a Central Park bandshell show in the 1980s. Her voice, with several decades of mileage on it, has deepened and acquired an appealing burr and grittiness. She's got a terrific road-tested band featuring former Wallflowers guitarist Stu Mathis, bassist David Sutton, and drummer Butch Norton. Masters of space and time -- not to mention rock 'n roll, blues, soul, and country, the humus of Williams' Americana -- they have an unerring knack for giving Williams' songs exactly what they need. On her two latest albums, the trio was augmented by ace guitarists Bill Frisell and Greg Leisz, who brought jazz improv and the Grateful Dead into the mix. Having reached a new peak with her recent music, Williams now looks back and revisits her 1992 album, Sweet Old World.Smart move. 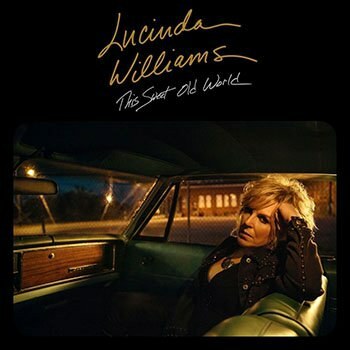 Coming between her much-praised 1988 release, Lucinda Williams and the superb Car Wheels on a Gravel Road ten years later, Sweet Old World "sort of fell through the cracks a little bit", according to Williams. "I remember going into a record store in Nashville and seeing it in the bin, and it had this sticker on it that said 'out of print'. I went up to the manager of this little indie store and said, 'This isn’t out of print!' He said, 'Well, that’s what I had heard.' It didn’t get attention paid to it that it should have had." An album with songs as great as "Pineola", "Little Angel Little Brother", the title track, and, well, just about all the others, should've gotten the attention their writer believes they deserved. Twenty-five years later, they just might, since the new versions Williams recorded for This Sweet Old World surpass the originals in every way -- her singing, the band's playing, and the arrangements. Williams, with Overby as co-producer, cut the album in just ten days in the same North Hollywood studios where she recorded its two predecessors. On some tracks, she didn't significantly change the arrangements. "Pineola", which, along with "Drunken Angel" and "Lake Charles" is one of her great songs about "beautiful losers", as she's called their doomed protagonists, differs from the original mainly in Williams' gripping vocal. When she sings "Sonny shot himself" you hear the shock and incredulity in her voice in the way she stresses "shot". But other songs have gotten more substantial do-overs. The 1992 album had fiddles, accordion, and keyboards; this time Williams decided to stick with just her trio, plus Leisz, who played on some of the 1992 sessions. (David Bianco, the album's engineer, contributes low-key organ on one track.) The result is a less cluttered, rawer, and more spontaneous sound, closer to live than the studio. It serves the songs better while allowing her splendid bandmates to shine. "Six Blocks Away" features Mathis on 12-string guitar, evoking both the Byrds -- the opening bars echo "Turn, Turn, Turn" and "Mr. Tambourine Man" -- and Tom Petty. (Williams recently opened for Petty and the Heartbreakers on some of his West Coast shows.) "Prove My Love", taken at a faster tempo than the more countrified original, and with sterling lead and rhythm guitar work, now sounds fully realized. The poignancy and deep empathy of "Memphis Pearl", a finely observed story-song about a young woman whose life becomes a string of disappointments after leaving her hometown, register more powerfully in the new, no-frills arrangement. And Williams' delivery of the lines Pearl sings to her baby -- "I promise it won't always be like this / Come here, sugar, give Mama a kiss" -- is quietly devastating. The most radical remake is "Drivin' Down a Dead End Street", titled "He Never Got Enough Love" on the 1992 release. Williams restored the original title, having discarded it 25 years ago when she saw that Bob Dylan’s album Down in the Groove included a cover of Hank Snow's "90 Miles an Hour (Down a Dead End Street". The new version uses the first draft of Williams' lyrics and adds new verses to the song, another portrait in her beautiful losers gallery. On "Hot Blood", a lusty and funny rocker, she gets hot and bothered when she sees her object of desire doing mundane things, shopping, washing his clothes, fixing a flat tire. "Well, I saw you in the grocery store / Buyin' tomatoes for a casserole," she sings, infusing the moment with an amused eroticism. And if the remakes weren't enough of a treat, This Sweet Old World includes four bonus tracks: "Factory Blues" (included on the 2014 re-release of her debut album); "Dark Side of Life", originally recorded for the 1988 compilation, A Town South of Bakersfield Vol. 2. ; John Anderson’s “Wild and Blue”, and "What You Don’t Know", a John Leventhal-Jim Lauderdale blues that was an outtake from the original Sweet Old World sessions. They're all first-rate. Redoing an entire album is a surprising and bold move, but on This Sweet Old World the gambit pays off. It's anything but a retread. The album offers the pleasures of familiarity -- we Lucinda Williams fans have loved the songs for a quarter-century -- while giving these gems new settings that make them shine all the more brilliantly.